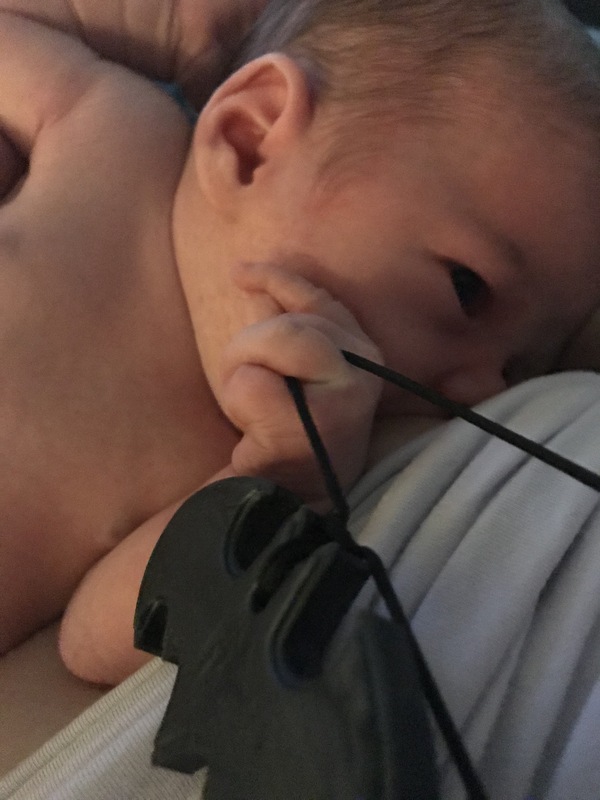 I’ve loved the idea of a teething necklace with breakaway clasp that I could wear while nursing, especially since I received one long ago from Bluum. Still I rarely wore that one for two reasons: it was incedibly long on me, and, as neither they nor I knew my baby’s gender upon sending it had mainly pink beads and I wanted something a bit more gender neutral perhaps even masculine as William is a boy. 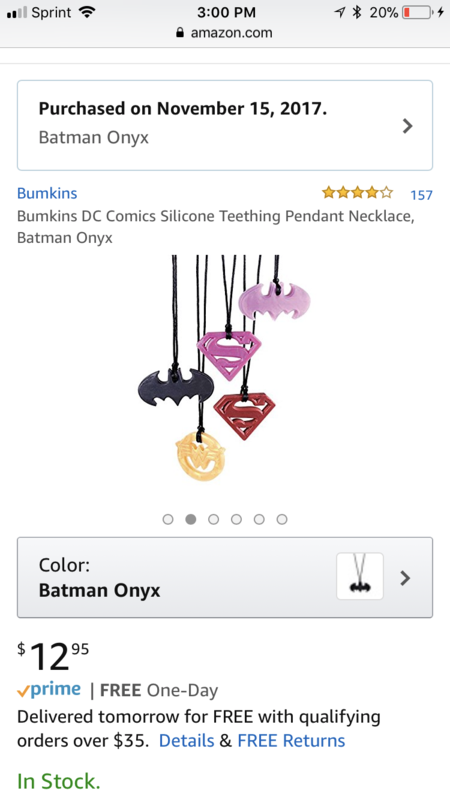 I was excited to see the Bumkins Batman Teething Pendant for sale on Amazon. The necklace is made of food grade silicone and thus cleans up fast and easy with just a bit of soap and water. The safety testing by the Consumer Product Safety Commisson (CPSC) proudly displayed on the package is very reassuring as well. I love the length, one of my key concerns.its a great length to wear out. It has a great stylish metallic look and on the day when I happened to wear purple reminded me of a Batgirl look. Even babies with no teeth can enjoy pulling at the necklace while feeding. Candy had doubted he’d use it for that at his age, and yet he tried that the very first time I wore it. 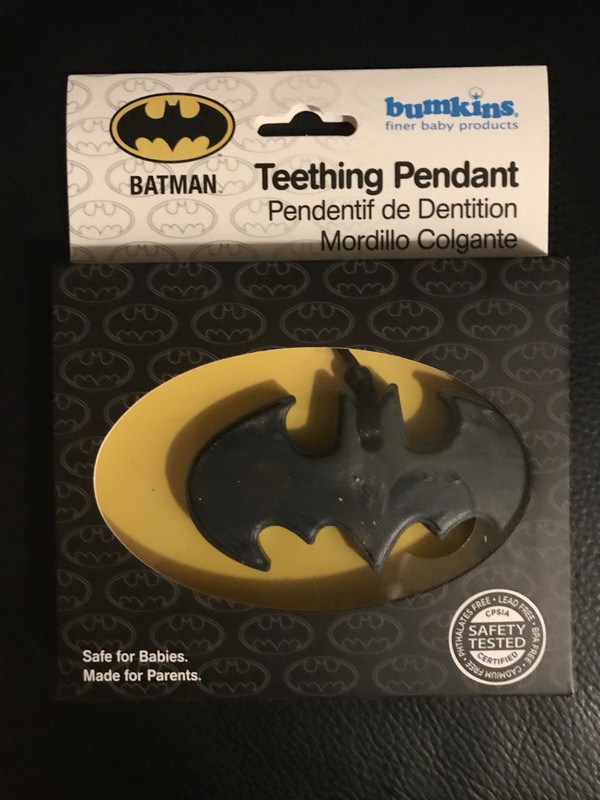 One thing I learned from Amazon reviews is that parents gave the necklace directly to older kids, three and up to chew instead od their nails, for anxiety chewing or both. The necklace is one of a collection of five options. Soon after I confirmed that William liked the Batman one, I brought a Superman one. I’ll definitely be getting a new one of each to give him when he’s three even if he’s not a chewed then as they’d be fun for him to wear.